Video testimonials can be a powerful way to improve online engagement, shorten your sales cycle and building trust with your potential residents and their family. We are offering a free white paper detailing the power of testimonial videos and tips for getting great testimonials that will help grow your business! A Senior Care Community thrives based on occupancy, and a well-executed online presence is key to getting your rooms filled. Video testimonials are a terrific way to reach your audience and influence them by providing word of mouth recommendations from a peer group. Your website, social media and email marketing efforts are the perfect vehicle for sharing testimonials as you probably know. In the whitepaper, you will learn more about influencing the decision makers in the senior care selection, why video testimonials are important, and tips on how to capture the most effective videos. But why are video testimonials preferred to written testimonials? • Videos are known to improve your websites visibility in search engine results, 50 times more likely to appear on the first page (Digital Sherpa). • Videos can boost rates in interactions with your audience. 80% of your online visitors will watch a video, while only 20% will actually read content (Digital Sherpa). • Video in email can increase open rates by 20% (Brainshark). So a video testimonial is more likely to be seen, shared and result in a visit to your website, a phone call, or maybe even a community tour! Want to learn more? 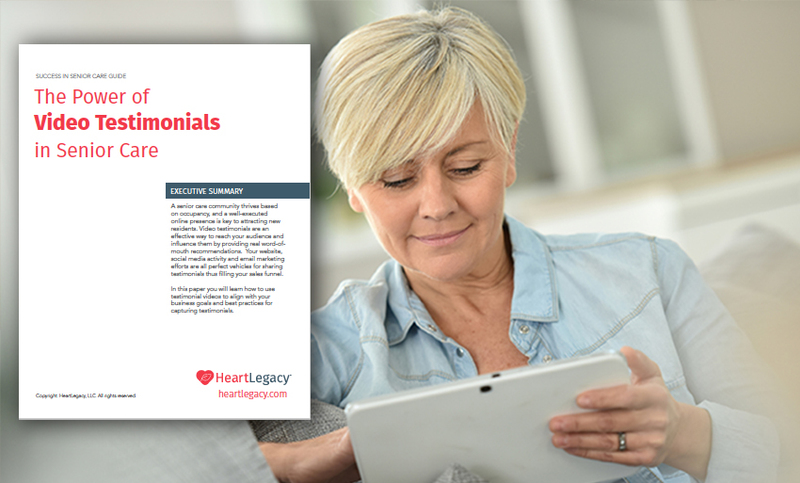 Request the complete whitepaper, “The Power of Video Testimonials in Senior Care”.